PLEASE NOTE: THIS INFORMATION IS PROVIDED AS A SERVICE ONLY; THINKFIRST DOES NOT STOCK OR SELL THIS ITEM. Originally developed by ThinkFirst state chapter director Nena Ray and her sponsoring physician, Dr. Michael Turner, this simulator can be a valuable addition to your injury prevention program. Now available through the Realityworks Website; please contact them for pricing and ordering information. 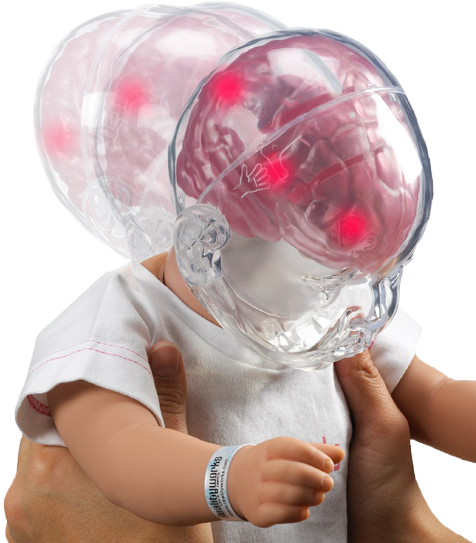 The devastating brain damage that occurs after just a few seconds of shaking an infant is powerfully demonstrated using this technologically-advanced infant simulator. The RealCare Shaken Baby cries inconsolably, just like real infants sometimes do. When shaken, accelerometers inside the head measure the force on the brain. The simulator’s cries stop abruptly for all the wrong reasons. Corresponding LED lights immediately show damage to specific areas of the brain in real time. Combined with a curriculum that helps establish a plan for coping with an inconsolable baby, the Shaken Baby simulator provides critical information for anyone who cares for an infant or trains future parents, babysitters and/or child care providers. Suitable for child abuse prevention, maternal and child health programs, and public or school health programs.